Indiana judicial officers attend the Pretrial Release panel at the Spring Judicial Conference in South Bend. In 2016, IOCS conducted regional, multidisciplinary stakeholder trainings on risk assessment that were attended by over 400 justice professionals. In August 2017, IOCS hosted an NIC-sponsored (National Institute of Corrections) pretrial training for judicial officers, prosecutors, defense attorneys, probation officers, and community corrections officers participating in the pilot project. 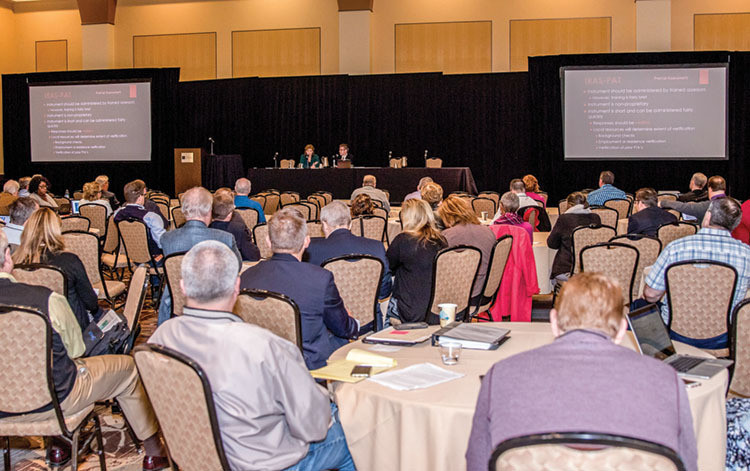 IOCS provided CR 26/pretrial related education sessions at several education events, including the 2016 and 2017 Annual Judges’ Conference, the 2017 and 2018 Spring Judicial College, the 2017 Probation Officers Annual Meeting, and the 2018 Justice Services Conference. IOCS staff presented on the pretrial project at the Indiana Association of Community Corrections Act Counties conference in November 2017. Altogether, IOCS and its partner agencies have provided over 95 hours of pretrial and evidence based practices education and training to over 2,000 criminal justice professionals since April 2016. A pretrial web page was launched with the latest information on Indiana pretrial activities. Throughout 2017, NIC provided technical assistance to the 11 pilot sites to develop local pretrial policies and procedures regarding pretrial assessment, release and supervision matrices, and defense counsel at first appearance. In December 2017, the Pretrial Committee completed the Indiana Pretrial Practices document, which provides an overview of the legal framework for bail in Indiana and evidence based pretrial practices, sample forms, and a description of the pretrial pilot site activities. In January and February 2018, IOCS staff met with local policy teams in Madison, LaPorte, and Vigo counties to provide an overview of CR 26 and the pilot project activities. IOCS staff convenes the pretrial pilot judicial officers and coordinators on a quarterly basis to discuss local practices, progress, and challenges. The EBDM Policy Team submitted a request for pretrial expansion to NIC in November 2017. The request is pending approval from the NIC Director. 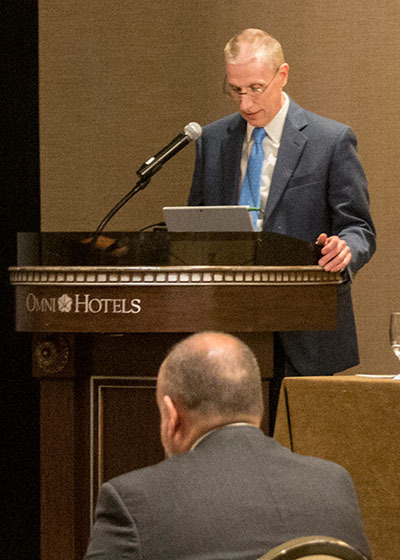 Indiana Supreme Court Justice Geoffrey Slaughter speaks during the National Center for State Courts’ Pretrial Justice Reform Summit in May 2018. Trial Court Technology developed the Supervised Release System (SRS) pretrial component. Allen, Marion, and Hamilton counties pretrial services are successfully utilizing SRS with its pretrial functionality. Trial Court Technology developed a pretrial data report that may be run for counties using SRS and Odyssey Supervision. Court Technology has developed a court hearing reminder system that will send text notifications for designated case events. Select pilot sites will test the system to eventually be deployed to Odyssey counties statewide. All pilot sites are collecting uniform data sets through SRS, Odyssey Supervision, and other data collection systems that will be used to examine pretrial outcomes at the county and state level. Dr. Ray at Indiana University-Purdue University Indianapolis’ School of Public and Environmental Affairs published the first pretrial evaluation report in July 2017 and is collecting data to complete an Indiana Risk Assessment System-Pretrial Assessment Tool validation for each pilot site. The first validation results will be available in late 2018. Results from the evaluation will be used to inform future pretrial policy and practice. In fiscal year 2018, the Indiana Supreme Court and the Indiana Department of Correction awarded a combined total of approximately $2.9M for pretrial activities to the 11 pilot sites, and Marion and Clark counties. Grant funds covered the cost of project coordination, pretrial assessment, supervision, defense counsel and prosecutor services at initial hearing, training, and court notification systems. Grant awards per county range from $50K to $335K.